In the first reading, Abraham did not spare his only son to be sacrificed in obedience to God. But God stopped him and the boy lived. The second reading reminds us that God did not spare his only Son who died on the cross for the sake of many. The Son died but has risen and lives forever. Both readings picture the presence of God. This is the message of the Gospel for today. 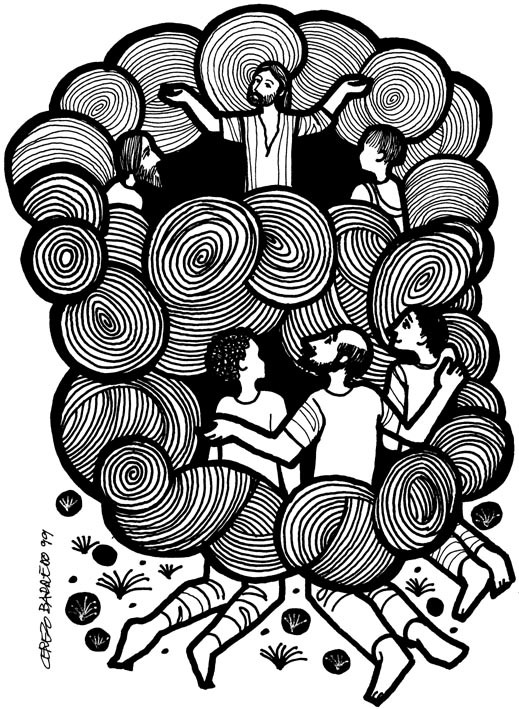 The transfiguration could be another form of epiphany – the manifestation of God. It shows us the relationship of the Father and the Son. In the Gospel, the disciples of Jesus heard his Father saying, “This is my Son, whom I love. Listen to him! (NIV)” We recall that in the baptism of Jesus, his Father said, “You are my Son, whom I love; with you I am well pleased (1:11 NIV).” In the baptism of Jesus, the Father was talking to him and confirming him of the Father’s love while in the transfiguration the Father was talking to the disciples and affirming the Father’s love to Jesus. In both cases Mark used the phrase “whom I love.” These are the two dimensions of the relationship of the Son and the Father – personal and communal. This is the relationship of Jesus and the Father, that is, they love each other. Love is the bond that binds the two together. It is the divine energy that runs from Jesus to the Father and vice versa. This is the personal dimension of the relationship between the Father and the Son. This divine energy is the same energy that runs throughout the mystical body of the Son, the Church. This is the communal dimension of the relationship of the Father and the Son. The Father is present in the Son and the Son is present in the Church. Therefore the Father is present in the Church through the Son. In this Lenten season, and for the rest of our life, the Lord invites us to walk before and with him “in the land of living,” that is, in his presence. Prayer: Lord Jesus, guide us in our journey called life. May our daily life be the divine energy for others. May we share your divine presence with one another because we are your body and you are our head. Amen.